I was ridiculously happy when I saw this book at the bookstore! I love Shimaki Ako, her stories are so cute and fun! And her art just keeps getting better and better with every volume. Seriously, her guys are totally hot now! ^_^ The art style is clean and crisp, and sometimes has an almost cartoony feel about it in the way some of the expressions are exaggerated, but it is so adorable! This is a wonderful collection of 4 short stories. I loved them all. I will say that the last story was really bizarre, and made me wonder where mangaka get their ideas sometimes! These stories were published in Cheese! magazine, but are not smutty. The first story is the one pictured on the annoyingly color-hazed cover. (Really now, one of these days I am going to post a general rant about how I am getting sick and tired of Flower Comics and their habit of placing random translucent color hazes over the cover art. I want to see the original art! Don’t obscure it with that brown haze! Argh! Er, anyway…) The story is about a plain girl named Chise. She is friendly and helpful, but for all of her life she has been overlooked in favor of her extremely beautiful best friend Mika. From kindergarten through high school, the only time a guy would pay attention to Chise was if they were using her to try and gain favor or information regarding Mika. Chise isn’t too bitter over this though. Granted, her self-esteem is not the highest after all of this, but she tends to take things in a positive way, and sees her plain self as a foil for Mika’s beauty. Her purpose is to make Mika stand out more. Story 2 is about a girl named Mizuho who is in love with her sempai, Shugo. Mizuho has loved him forever, and thanks to a little sneaking around, she has set up a meeting with him. As he waits outside at night for the person he thinks he is expecting, Mizuho ambushes him! Under the cover of darkness, she kisses him! Mizuho treasures her kiss with sempai and hopes he won’t figure out it was she who kissed him. You see, there is a slight obstacle to her pursuit of Shugo — he is her beloved older sister’s boyfriend! As time passes, Mizuho’s sister always stands (one way or another) between Mizuho and Shugo. Mizuho knows that Shugo only sees her as a little sister, but what else can she do? Finally, we have a totally random short story that had me thinking ‘what the–‘ after reading it. It is such a random story! Manami is always teased by her classmates for being ugly. Only Satoru-kun defends her. In fact, he declares he loves her! But this world is so cruel… they will have to find another world to live in! Satoru has heard rumors of a pond that will take you to another world. Can Satoru and Manami take the jump there together? What sort of place is waiting for them? 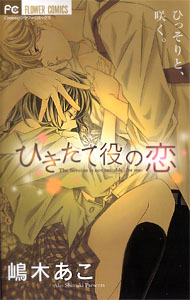 I wasn’t impressed with her serialization of Gekka no Kimi, but her short stories and one-volume titles are wonderful. I just can’t get enough of them!